Our Personal Site of the Week is Karyl Valdez’s. About Karyl: Karyl is a #GlossBoss who works inside of a Sola Salon Studio in Albuquerque, New Mexico. Karyl specializes in hair, providing services in coloring, cuts, and Brazilian blowouts. Before/After photos are HUGE in the beauty industry for a simple reason: everyone loves a Cinderella moment. With her service photos, Karyl shows how she can transform a client’s look into something absolutely stunning. Potential clients who are able to see the results that Karyl can create are more likely to book her. Clear Focus on the Client Relationship: Karyl focuses her bio on what she can do for the client. She emphasizes that her goal as a hair stylist is to help her client with their needs and educating them on styles, trends, and hair care. This instantly creates a more personal connection between Karyl and her potential clients. Easy to Find Location and Hours: Karyl has made it very easy for her clients to find her by providing her salon address and working hours all in one place: the “About” page. 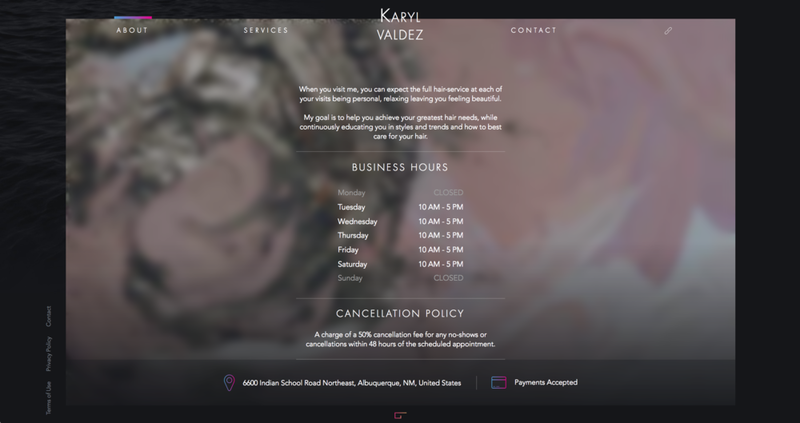 Cancellation Policy Up Front: Karyl has displayed her cancellation policy clearly on the About page, so that there’s no confusion over payments if a client needs to cancel. Karyl was able to easily use her new personal online booking site to improve her original website. When you click on any of her services or book on her personal site, the site automatically takes you to the GlossGenius booking site. Want to set up a personal booking site like Karyl’s? Get a stunning website and sign up for your free trial of GlossGenius here!